Packing for a winter camping trip in Moab is confusing. It requires a thorough assessment of gear for a range of really cold scenarios while organizing it in shorts and flip flops. Most of it was done on the deck of the guest house. Departure required attention to critical goals. First I had to leave town early enough to get lunch at the Love Muffin and catch Penelope in time to get my gratis Love Muffin insulated mug – making me an officially ‘sponsored’ athlete again. It was pink. Next I had to calculate backwards from planned visit with B-Rad, Magali, and Arnie in SLC to arrive in time to effectively discuss gear, present and future, and catch up on their upcoming adventures. I crashed at their place. Next day’s drive from SLC to Island Park started early with a quick blog post from my favorite coffee shop The Coffee Garden. Equally great food and open minded culture. These tables and chairs are where I last got the last update from Frippe and Trey before their summit push on K2 in 2010. Today I took some solace in estimating my Yellowstone Ski tour as having fewer objective dangers than the stunningly beautiful Cesan Route. Somewhat for myself but mostly for my mother. David and I skied into his cabin in the late afternoon. Groomed snowmobile tracks lead us to the door of his small but very complete cabin. 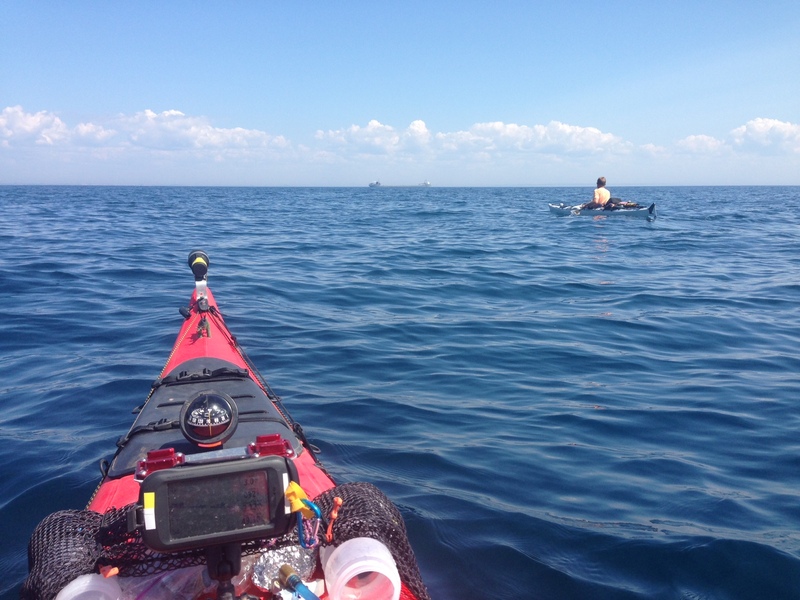 The two and a half miles went quickly, my gear and setup raised no red flags, and I remember from our Lake Michigan Kayak he has a faster pace than I.
David cooked an amazing steak dinner. We had a cocktail and set our alarms for 5:30 AM. The weather forecast was excellent, our gear was dialed, we were sufficiently fit, and the terrain promised to be outstanding. I fell asleep in flannel sheets for the last time in a few days. My name is RJ Masselink I am a Dordt College student which is located in North West Iowa. I am not only Dave Schipper’s contact man for his adventure through Yellowstone this week but one of his favorite nephews. I love everything outdoors and am intrigued by the trips Dave goes on. Everytime Dave calls me I am excited and eager to hear what he has to say because with a guy like Dave you never really know what’s brewing in his head. This is not the first time I have assisted him on a trip. 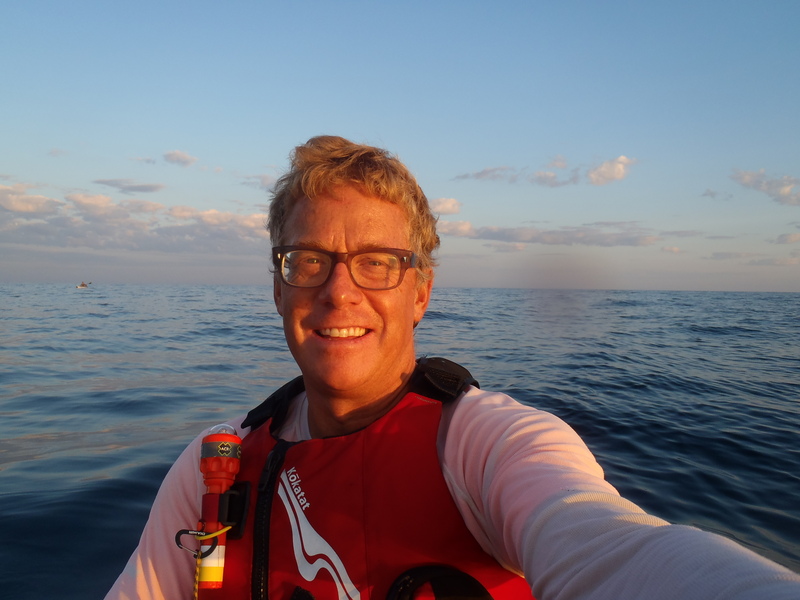 In 2013, Dave asked me to be his contact as he kayaked across Lake Michigan. I am always honored and ready to jump on every opportunity I get to help him out…. even though as time goes on and we all get older (Dave), I am more likely to have to do some work and bail him out. Lucky for me I am in North West Iowa and would be sending someone else in to lend a helpful hand while I make the phone call. Happy trails and always remember “Fail to plan, plan to fail” wise words of the day. It was bound to happen sooner or later. I have a vigilant list of excuses waiting to rationalize its inevitability. As a self-employed business owner, self-exiled to the hinterland of the Utah desert southeast, I strive to maintain a self-imposed level of professionalism. I remind myself that my clients are in offices run by HR departments. I’ve had several close calls in the last months. Thursday morning, I’d been up early emailing factories and clients in 5 countries. As noon slipped by I planned a way to get to the Love Muffin before closing. I have a million things on my mind and feel pulled in opposing directions (segue into excuses). Two blocks from home on a splitter sunny spring day, riding my favorite cruiser, I have that sinking feeling, the knowing of which cannot be undone. It has happened. I have worn my camo slippers (with rubberized soles) out of the house. There is no excuse – it has happened and I need to face its reality. To get my game back and reassert my priorities I think a few days of winter camping is needed…. Looking right I see Dave a long ways away paddling in a path off mine. I look at my GPS and check my old-school compass. Why he is heading so far south? All things are going right but I have zero band width for navigation errors. I yell my concern and he stops paddling long enough to say he was wondering where I was going. There is an edge to our dialogue. I pride myself on navigating and generally think I’m right. We haven’t paddled a mile more than our point-to-point mileage. So what the f#@k was he doing paddling south? In a matter of seconds my fuse is near its end. I want NOTHING to do with a delay or additional mileage because Dave can’t get it right. He doesn’t deviate from his course and is pulling away from me. I shout that I am coming over – we need to figure it out. As I near my voice carries a tone of accusation, ‘where are you going – even my compass bearing has me going on the right path’. He states the waves are pushing us north so my navigation is wrong. Again I tell him he is wrong because my GPS is tracking correctly. ‘THIS IS NOT THE FIRST TIME I’VE DONE THIS!’ he yells. And he is right, I am wrong. I’m lucky to be paddling with him. He is competent, experienced, and level headed in a way that is assuring even if things got really tricky. It is a rare combination of skill and personality. …and he is patient! The last few rest stops I watch our position on my GPS as I lazily bob through 3-foot swells. I wonder if Dave notices we are drifting 2-3/10ths of a mile during each stop – in the correct direction. A light breeze is to our backs and waves are pushing us to our destination from the southwest. I can’t believe our good fortune and at the same time I refuse to verbalize it for fear of jinxing it. Dave, too, has said nothing. I had hoped to see shore at about 15 miles out. There has been a steady layer of humidity over the water and even at mile 50 all there is haze. I’m significantly less wigged about being on the open water. The swells are bigger than mid-day but have nominal weirdness. Boats of all sizes begin to appear, and I begin to worry about wakes from freighters. Momentarily I panic because my course looks to intersect with one on our left. I glance at Dave and realize I have again drifted significantly off course. Fatigue is beginning to show its effects. 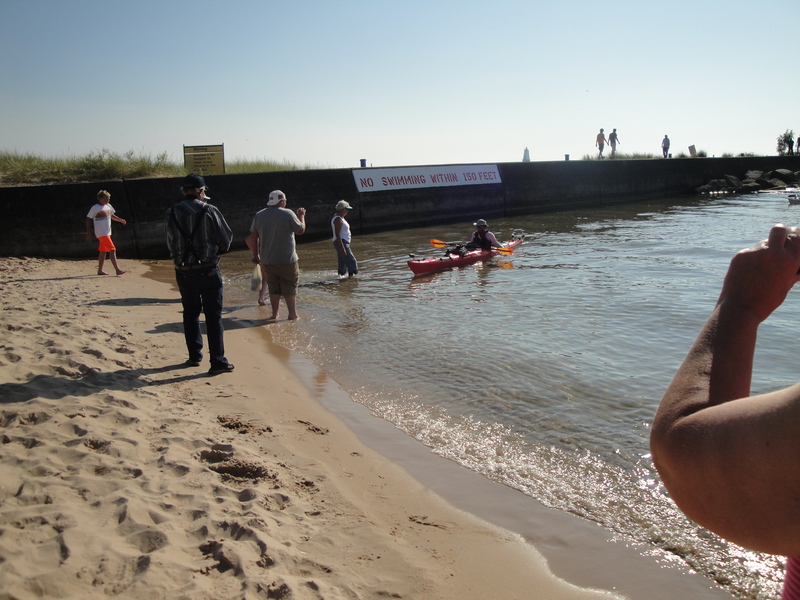 The finish at Ludington, MI. Though I had hoped for it even before starting, we were suddenly almost finished. It felt like a split second switch going from not wanting to jinx its conclusion with conversation to a panic that it was over. I could see my parents, family and friends running along the pier, cheering us home. Dave might not have been used to all the hub-bub that comes with my family. I had nephews wading in to help us dock and my Mom rushed in for a congratulatory kiss. Dave got one too!! Pulling up to a warm Michigan welcome. Looking at my GPS it recorded 16:32 hours covering 62 miles. I had planned for 20-30 hours. What a deal!! Walking to the car with my first load I wondered what had just happened. For some reason I was confused and even found myself questioning why I did it. Really weird. It was great to involve my parent, family and friends – I was also grateful things did not go wrong with everyone occupying a front row seat. Maybe it will get clearer on the drive back home to Utah. Dawn on Lake Michigan from Outdoor Labs on Vimeo. When the sun came up the miles covered in the dark lose their sting. Starting a trip in the dark makes the dark section feel disconnected from the trip. 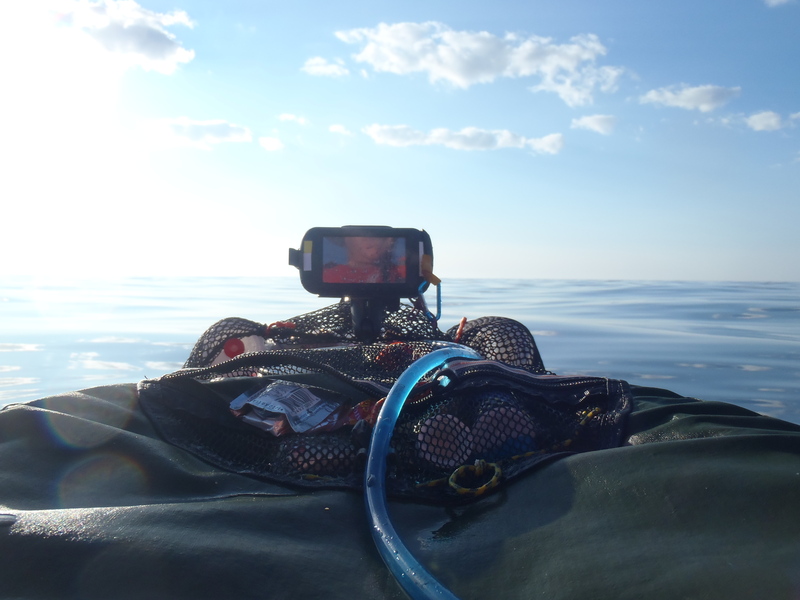 It had worked well on past climbs, bike rides and hikes, but it wan’t working out as well in my boat. 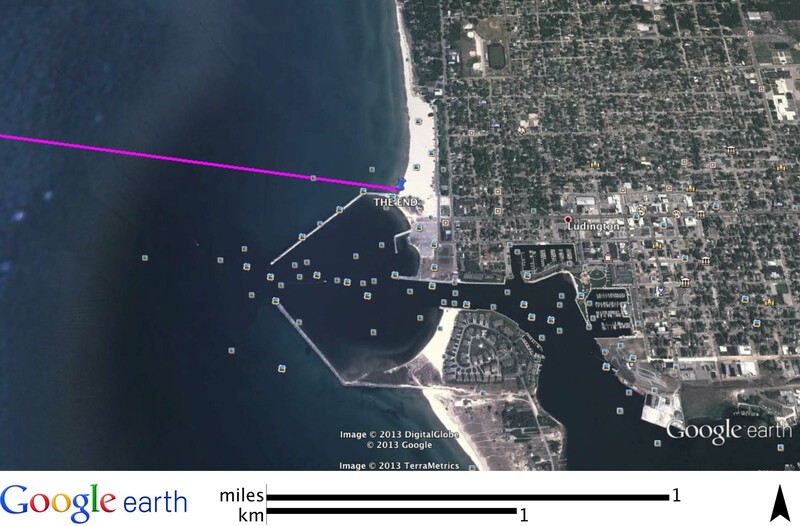 It felt incredibly grounding to be able to see the horizon line, but waypoint mile 30 (midway) is still in our future. I’m completely out of reserve energy: it was consumed by anxiety and the ineffective paddling of my ‘dark’ strategy. “The last 30 miles are the hardest”, says Dave as my GPS chimes we have finally crossed the halfway point. Unbelievable. I’m struggling to wrap my head around the idea that I feel fully tapped. All the experience I have suffering in my past makes me wonder what I am currently made of. I’ve not seen the edge in several years and now it looms as undeniable and undefined as the horizon. When my friends, the ones that have accompanied me in other adventures, quizzed me on this trip I explained why I was drawn to the idea and how I thought I was qualified. I’m talking about the guys that have seen the edge with me and were fortunate enough to return on the safe side of it. From hypothermia, to dropped ice axes, to awful bike crashes, to avalanches, these are not people who blow smoke or are interested in hype. They understand the drive and commitment. They measure my objectives with experience and first hand knowledge. Their questions are for knowledge and not judgement. When explaining my qualifications, I explain that I am fit enough to paddle the distance, and I’m a reasonable navigator. I am lacking in depth and range of paddling skills, BUT I am level headed in trying situations and have a low RPM, high torque motor. I’m a metaphorical American-made truck form the 80’s. Sun and sky reflect off the water in every direction, as far as I can see. There is nothing man-made, anywhere, 360 degrees, except our boats. Incredibly the waves diminish and the wind is light and to our backs. It reminds me of early morning light on the summit of the Mont Blanc. It soothes me, and my fear of the water disappears. Still, I am worried about paddling to our destination. Dave has gotten his pace back, and I can’t keep up. We’ve agreed to my analytically driven plan to rest at every 5-mile waypoint with a short rest in between. I have done the math and that is only 12 segments. I’m not sure I can go non-stop for 40 minutes. As my mind wonders, I trouble shoot why I’m feeling flat and what I could do to better my odds. As obvious as it seems, I finally realize I haven’t been eating enough. At the next break I dig out one of the burritos I made for the trip. In my mom’s kitchen it tasted great: sausage, eggs, cheese, potatoes and salsa.. Now it was a matter of forcing it down with hopes of it not returning or prompting another dip in the lake. Refueling accomplished, I hit my caffeinated gels in hopes of staying awake. I drink coffee but am not a fan of 5-Hour Energy drinks – until now. Can’t say I’d recommend it for everyday consumption, but if your paddling across Lake Michigan, it sure helps. The more I paddle the less I am afraid about our outcome. Dave still outpaces me, but surprisingly when I glance at my GPS it says my speed is a consistent 5.5 mph. Maybe I am hallucinating. Weirder things have happened, and I’m kinda giddy from the caffeine spree. Time and effort is slipping into a non-linear experience. My paddle stroke has miraculously morphed into the core-centered effort necessary for big days. Already I can barely remember details of being on the bouncy water in the dark. Tendonitis in my shoulders and forearms has been kept at bay with Vitamin I (ibuprophen). I see the red arrow on my GPS nearing a waypoint…mile 45. Though it is not showing on my GPS, we may see land on the horizon soon.